China is the only major world power to have entered the twenty-first century with a thriving prison camp network—a frightening, mostly hidden realm known since 1951 as the laogai system. This book, the most comprehensive study of China's prison camps to date, draws from a wide range of primary sources, including many compelling literary documents, to illuminate life inside China's prison camps. 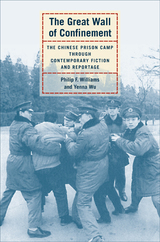 Focusing mainly on the second half of the twentieth century, Philip F. Williams and Yenna Wu outline the evolution of the laogai system, construct a vivid picture of prisoners' lives from arrest and interrogation to release, and provide a troubling new perspective on the human rights issues plaguing China. Philip F. Williams is Professor and Head, School of Language Studies, Massey University, New Zealand. His previous books include Village Echoes: The Fiction of Wu Zuxiang (1993). Yenna Wu is Professor of Chinese and Director of the Asian Languages and Civilizations Program at the University of California at Riverside and author of The Chinese Virago: A Literary Theme (1995), Ameliorative Satire (1999), among other books.